The body of the stein is a smooth, blue glazed, high quality stoneware decorated with a gold wrap around design. This stein has been crafted to highlight the progression of the manufacture and career of the C17 Globemaster III. 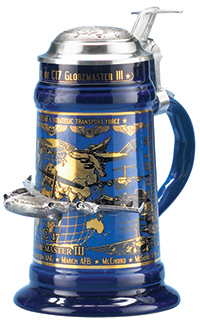 A detailed pewter figurine of the from half of a C17 Globemaster III, including wings is situated at the center of the wrap around decoration, such that it looks like the plane is flying out of the stein. To left and right of the figurine are a number images of the plane flying and a timeline of the history of the C17 Globemaster III. An ornamental pewter lid with raised pewter globe complete with compass rose and a pewter figurine of the tail of the plane completes the piece. Limited Edition of 5,000 individually numbered pieces.